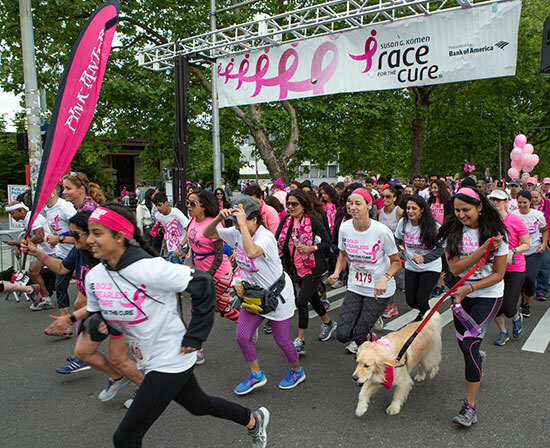 Thousands of walkers, runners, breast cancer survivors, patients and supporters gathered at Seattle Center on June 3 with the mission to end breast cancer through the 25th Anniversary Susan G. Komen Puget Sound Race for the Cure®. Survivors and patients took center stage during the emotional More Than Pink March, led by the Seahawks’ Blue Thunder Drumline. Then, walkers and runners—many accompanied by their pets—filled the streets of downtown Seattle in a show of support for Komen’s mission. The event, presented locally by QFC, has raised more than $500,000 in 2018, with donations and corporate teams’ matching dollars accepted through the end of July. Race for the Cure proceeds are invested in local grants to provide underserved women with breast cancer early detection screenings, patient navigation and financial support for basic needs while undergoing treatment, as well as research to better diagnose, treat and ultimately cure breast cancer. Since 1994, Komen Puget Sound has invested more than $30 million in local organizations and agencies providing breast health services to underserved residents in Western Washington.